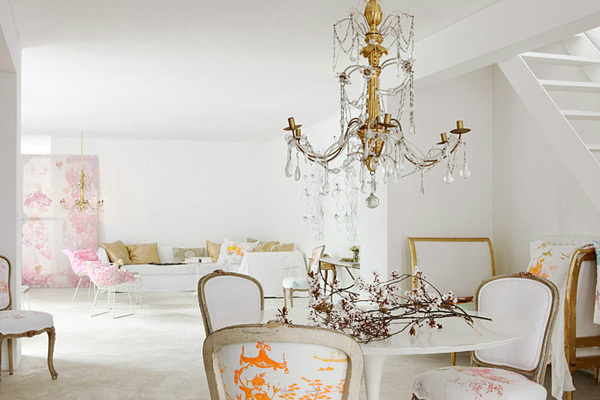 This beautiful home located in the South of France belongs to Carolyn Quartermaine, an artist, designer and stylist. 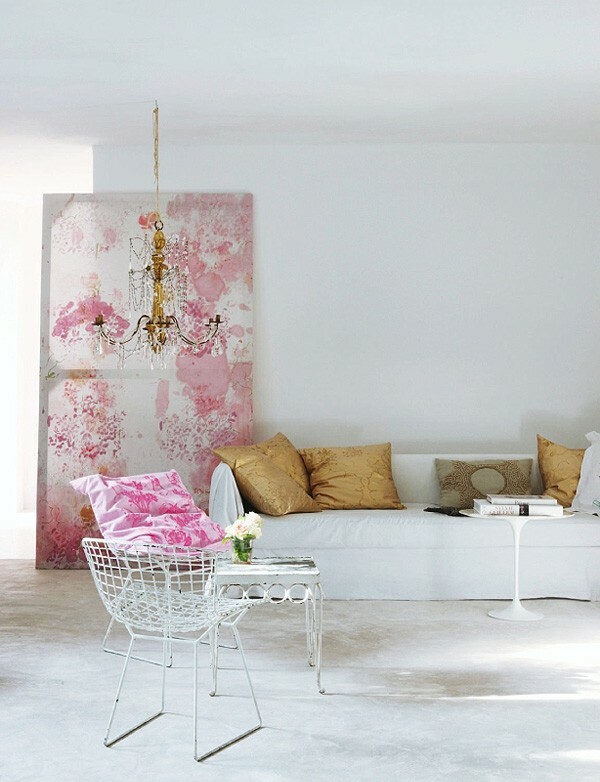 When I first saw it in Livingetc, I was naturally drawn to the simple, white interiors but what really struck a chord was the incredibly elegant and feminine style of the home. I was fascinated by the fact that I could see no skirting boards, door frames or cornicing, despite the property being built in the 16th century. During an extensive renovation Carolyn intentionally stripped back the rooms to their simplest forms: pale waxed cement floors, unadorned walls and enormous glazed panels replacing fussy over-designed windows. This uniquely interesting idea of removing all architectural elements has resulted in the simplest of backdrops, perfectly showcasing Carolyn's beautiful furniture and vibrant fabrics. I love how Carolyn props her paintings up against the wall rather than hanging them. This pink one looks beautiful paired with a gold chandelier from a market in Nice, and gold cushions made from fabric in Carolyn's Flowers collection. 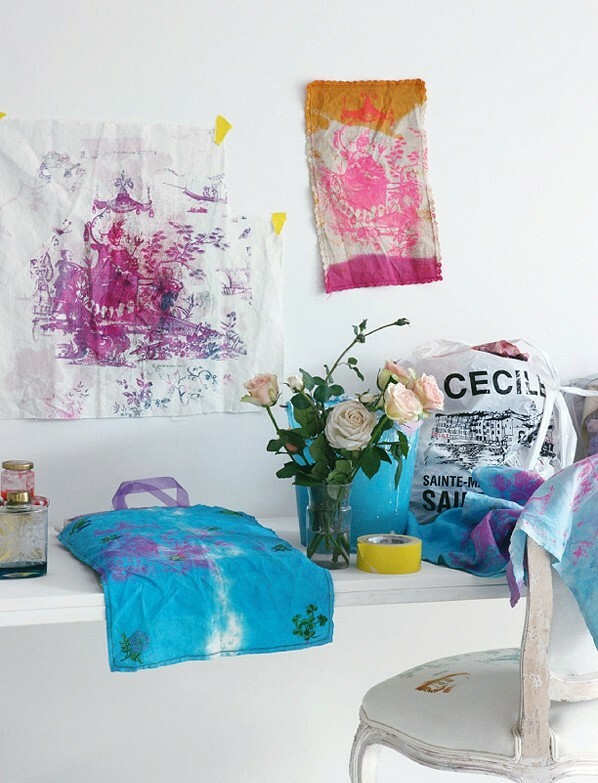 Colour is introduced with pops of acid green and pink neons. How dreamy is this bedroom? I love the low hung chandeliers and the hand-printed turquoise velvet throw by Carolyn. 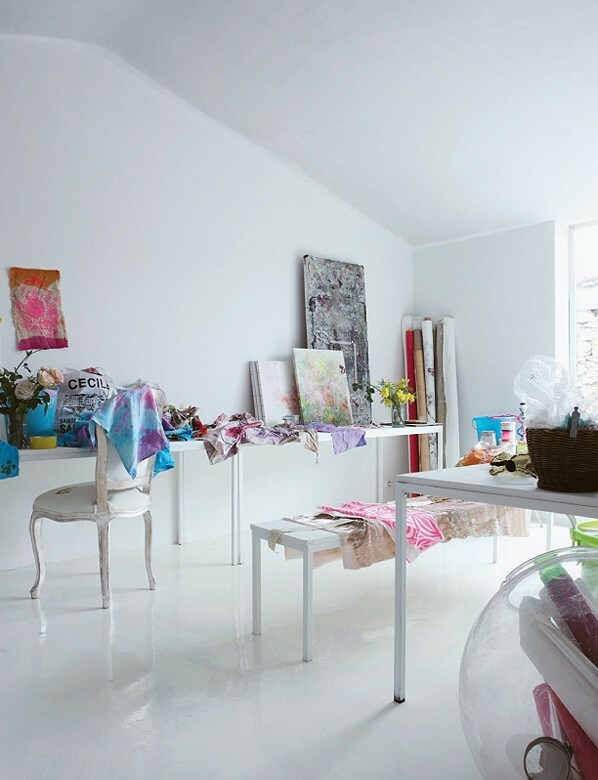 Carolyn's studio located on the top floor is furnished with simple white tables where Carolyn works on creating her colourful fabrics. 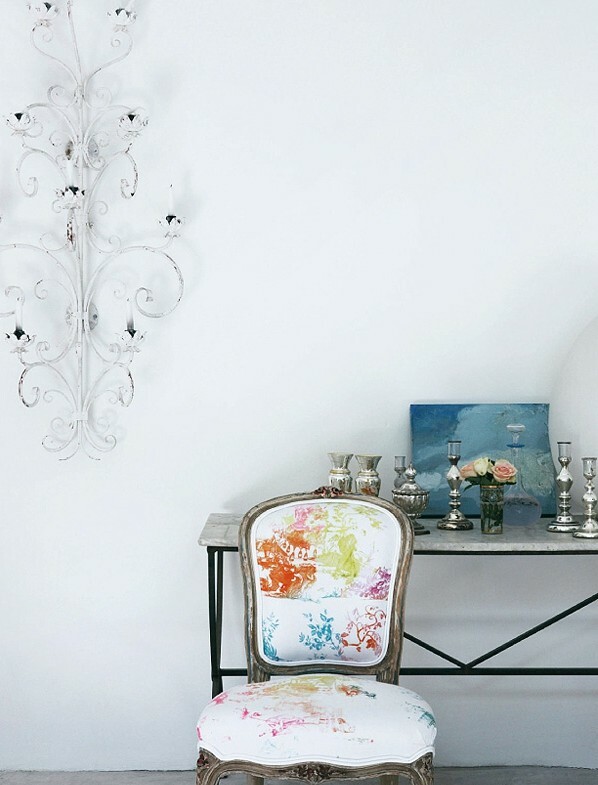 The beautiful dining chairs are covered in Carolyn's hand-printed modern toile design on white linen. 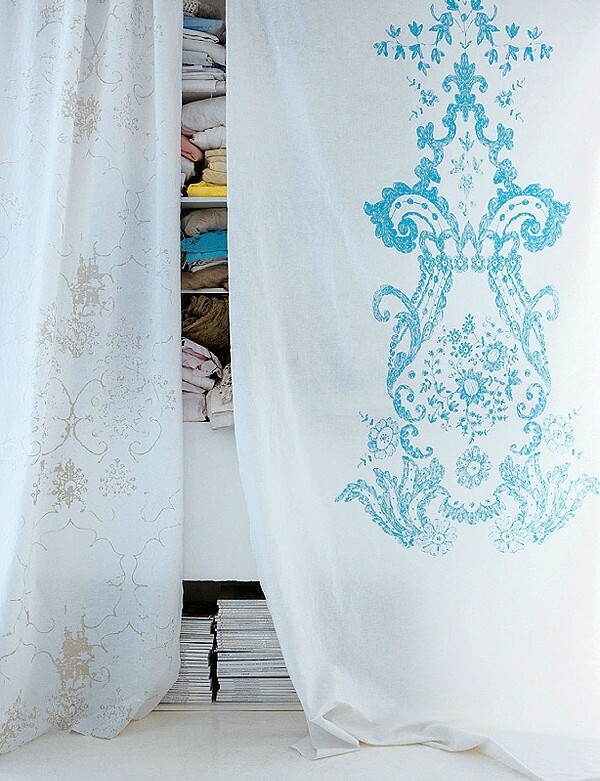 Pretty fabrics provide a soft alternative to closet doors. 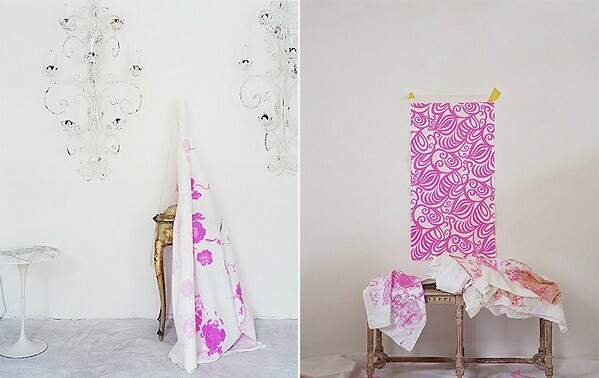 Along with hand-printing her own fabrics, Carolyn's work includes projects as diverse as designing a hip restaurant to sourcing furniture for clients. As both a place she lives and works, she describes her home as being a 'three-dimensional mood board. My space is both an inspiration and it's work...' It's certainly an inspiration for us, wouldn't you agree? This is so beautiful. I really like the Scandinavian style but it is so refreshing to see that there is something else which is white spaces and a different touch! 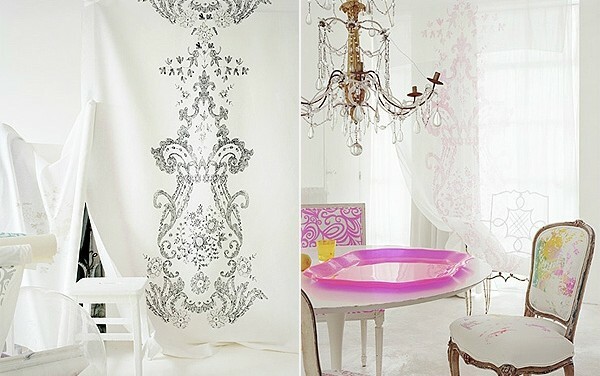 Simple, eclectic and inspirational. Great find, Michelle!